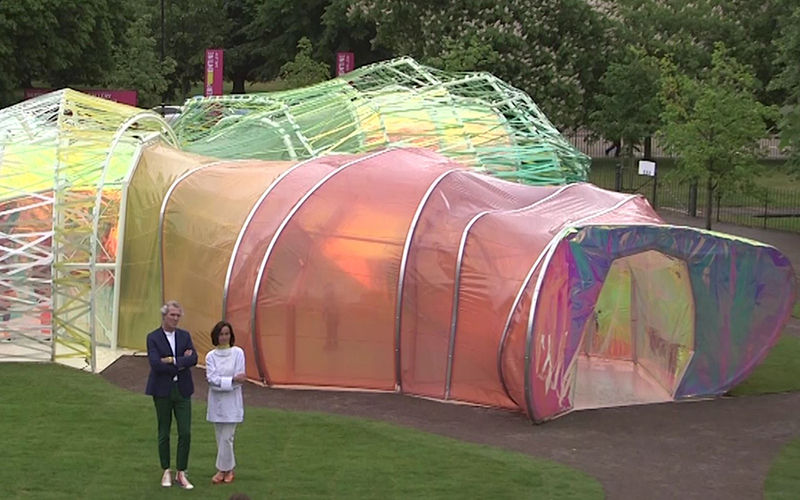 As construction of the 15th annual Serpentine Pavilion completes, Infrastructure Intelligence takes an exclusive behind the scenes tour of the new multi-coloured fabric membrane structure. While Spanish architectural practice selgascano is the creative force behind this year’s Sepentine Gallery Pavilion, AECOM in collaboration with David Glover provided the engineering and technical design services for the colourful, translucent, chrysalis-like structure. The temporary exhibition space opens to the public tomorrow (25 June) and features with a number of different entry and exit points plus a ‘secret corridor’ between the outer and inner layers of the structure to lead visitors into the pavilion’s stained glass-effect interior. “The Serpentine Pavilion is always an exciting project to work on, and this year’s design was no different,” said Tom Webster, AECOM UK associate director, structures. The polygonal structure comprises panels of a translucent, multi-coloured fabric membrane called Ethylene Tetrafluoroethylene (ETFE), which are woven through a solid, steel frame. AECOM designed the frame to enable the ETFE panels to deform and deflect, meeting the architect’s goal of movement and lightness, while keeping it structurally sound. The multi-coloured effect was created by printing the Pavilion’s 19 colours directly onto the EFTE panels, avoiding the need to order pre-coloured material that is only available in bulk, reducing both the cost and carbon footprint of the scheme.